This Emma: A Victorian Romance Season 1 collection contains episodes 1-12. Special Features: Character Biographies, Textless Opening, Textless Closing, Japanese Promotional Commercial, Japanese TV Promotional Spots, Japanese DVD Commercials, US Season One and Season Two Trailers, Previews. 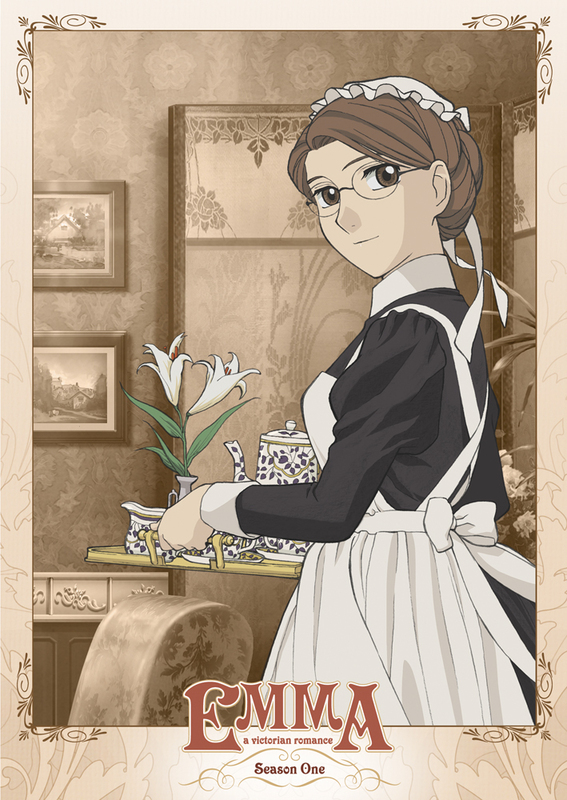 Emma is based on the equally wonderful manga by Kaoru Mori, and bears no relation to the Jane Austen novel. As you can guess by the cover, the story revolves around Emma, a Victorian era English maid. Her quiet dignity and kindness earns her the affection of her employers, co-workers, and a young son of nouveau riche, William. Romance and social class conflict ensue. The first season is very faithful to the source material, and the art and animation definitely capture Mori's style. The second season makes some drastic changes from the manga, but I believe it was for the best, for reasons I can't explain without spoilers. The package was nice. When I put it in to watch it ran excellent. Its a must have for your anime collection. I first saw the first season of Emma on YouTube. I fell in love with it in its first few minutes. If you love romance, fun characters and a journey of two people who love each other you should get this and of course season 2. Emma Season 1: What a Pleasant Surprise! I bought this for my wife and I had fairly low expectations for this show. Whoa, was I surprised! The plot was solid, the characters were well-developed, and the drama was nearly perfect. There were just the right amount of moments of romance, sadness, happiness, and even a few moments of mild humor and suspense. Talk about a season cliffhanger! As soon as you finish watching episode twelve, there's a sense of urgency to see what happens at the beginning of collection two. It's hard to fathom someone not giving it at least a 4/5. For me, a pleasingly unexpected 5 thus far! Definitely worth a watch for anyone who enjoys quality in their anime for the aforementioned reasons. This anime is in my top three favorite animes of all times and personal favorites. Set in Victorian era, a weathly upper-classmen William Jones decides to visits his old Governess five years after she retired. When he made to her home, he met her pretty maid Emma. As the two fond a romance they will face so many changelles and as well showing the upper class society, also a another romance blooms for William. This is worth the buy.